Below are several more mugs that don't fit into the other categories. 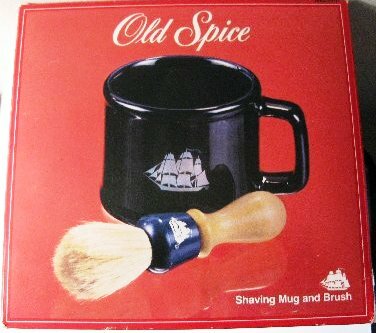 The Blue/Black mug came in a gift set; the traditional looking style mug was not sold commercially but rather was given out as a promotional item; and the remainder are various coffee mugs with the Old Spice logo. I do not know anything about this mug and was unsuccessful getting information from the Corning Glass Company. 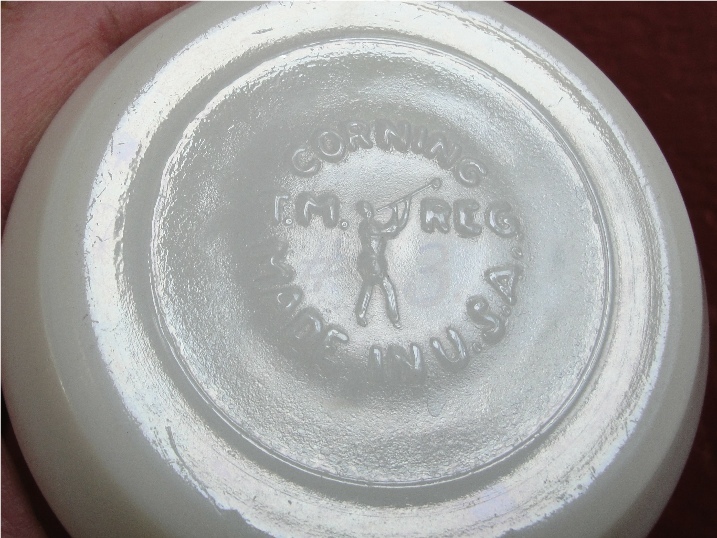 The Corning Mark is clearly bisible on the bottom. The owner reports that the glass is very much like the "milk glass" developed by Wheaton for most of Shultons mugs and bottles after the nid 1940s. 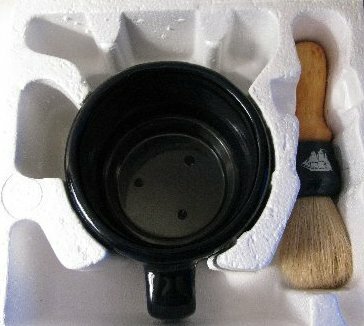 It's shape more resembles a coffee mug than a shaving mug. Pkease contact me if you jave any good information on this! 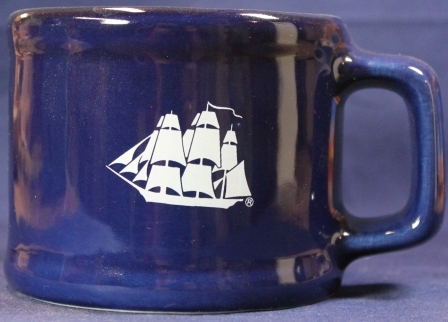 This mug is heavy pottery with a deep blue or black glaze and was sold in two different gift sets in 1985. 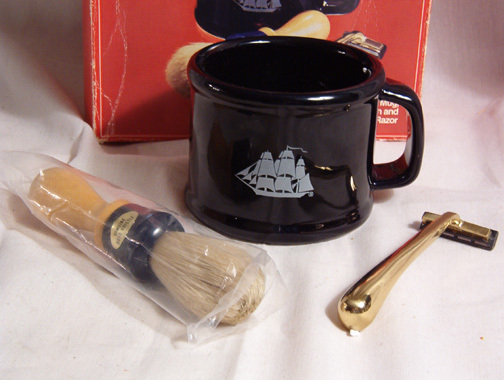 One set included a shaving brush and razor while the other included only the brush. The only decoration is the single white ship in silhouette. I believe this may have been distributed outside the U.S. market because it is dated 1985 yet the packaging is not consistent with the 1981 logo change. 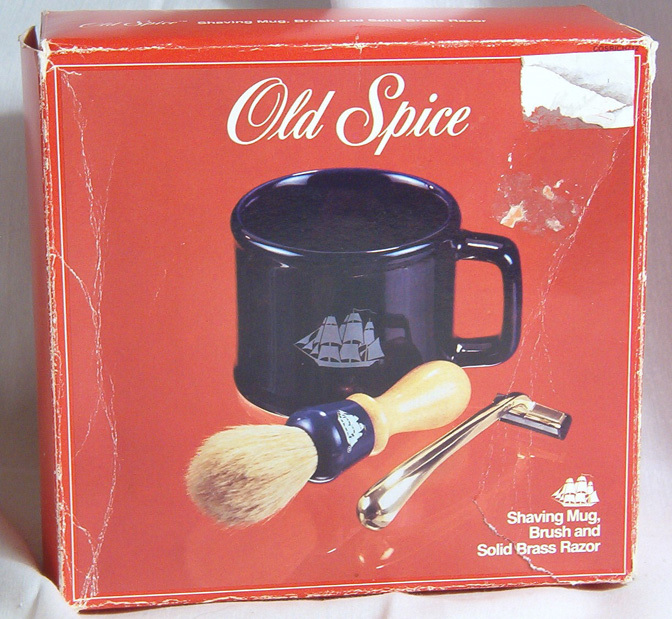 The back of the box is marked "Old Spice Accessories made under license from Shulton, Inc. 1985" "Made in Taiwan R.O.C. for Cosrich Inc., Perth Amboy, NJ 08861" Dimensions: 3.25" high by 5" rim to handle. 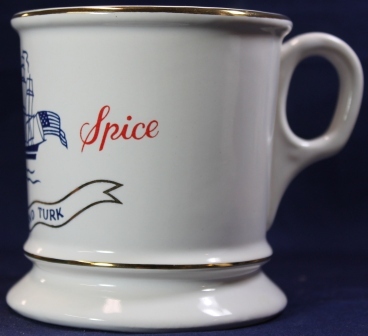 This mug is 3.5 inches high with a more traditional style. 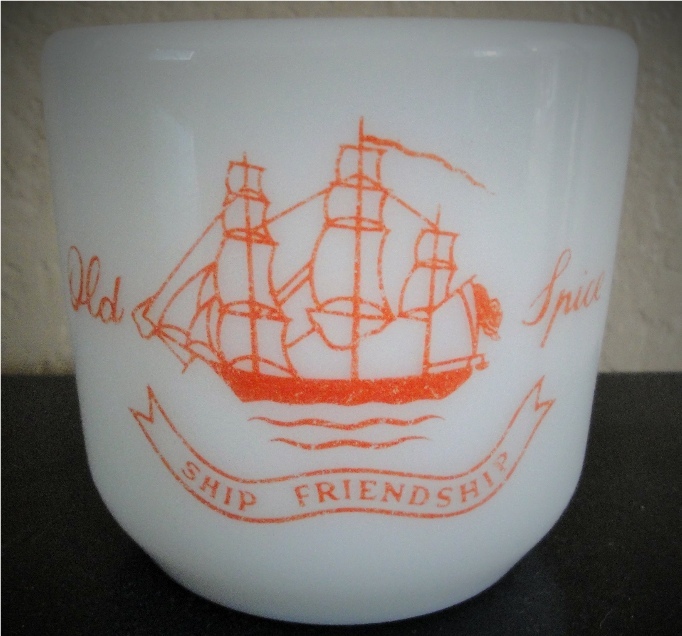 It was manufactured by the Nelson McCoy Pottery Company around 1970. Correspondence with former Shulton employees indicates that it was not marketed commercially, but appears to have been a premium or gift given by sales representatives to their accounts. It may also have been given to employees or store merchants as a gift. 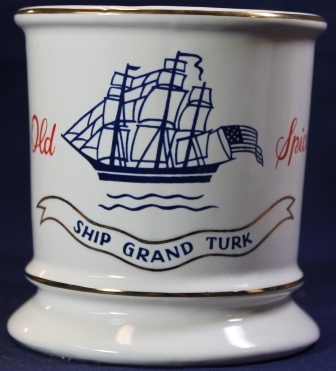 "USA" is incised into the bottom; there are no other markings.